Almost wordless: Monarch Butterflies visited the wildflower garden last weekend. 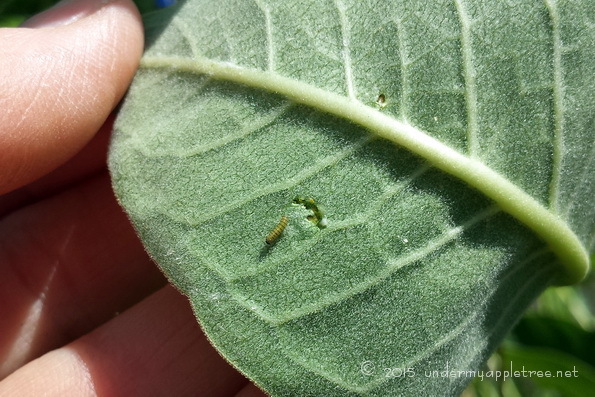 I checked the Milkweed a few days later and found a very tiny hatchling on the underside of a leaf, about 2 or 3mm long. JUST GOT BACK FROM CORFU WHERE THERE ARE SOME STUNNING BUTTERFLYS X.
Aw, so nice! You have the best garden/yard ever! I didn’t know they started out so little. Great shot! WONDERFUL photos, Leslie! I love to see these caterpillars on my milkweed plants. 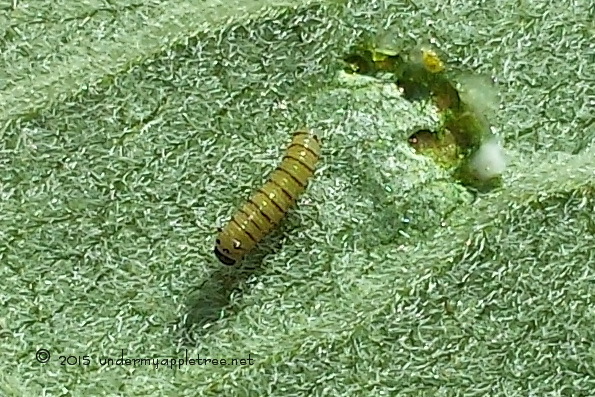 They start out teeny tiny, and get larger and plumper as they devour the milkweed.